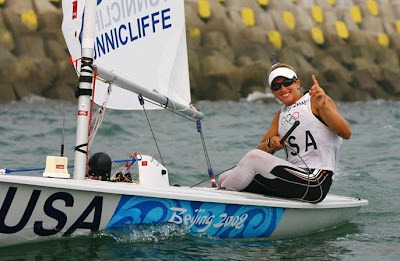 (By Anna Tunnicliffe) I won the Laser Radial Olympic Gold Medal today! As I stood on the podium this afternoon for the medal presentation, I had this flashback. I was standing in the same position as I had a year ago when I won the pre-Olympic regatta in Qingdao. But this time it was real! This is something I’ve wanted so long and now all the emotions are crowding in on me. Everything has been a whirlwind since I finished racing nearly four hours ago. As I sit down to write this, it’s feels like the first time I’ve stopped to draw a breath, but the high is still continuing. I’ve been told to expect a call from the Wall Street Journal! And I’ve been reminded by reporters that I’m the first American sailor to win Gold in these games..
My race today wasn’t easy and I’m sure I caused some heart-stopping moments for all the American supporters who crowded the breakwater along the right hand side of the course. Overall, it was a pretty stressful race. The breeze was light and shifty, from the northwest. I got out there early to watch the Men’s Laser Medal Race and see what I could learn. For our race, the fleet crowded the weather end of the line and I heard at least one boat called over early as we started. I was right next to her and I wasn’t going to take any chances so I went back too, along with a couple of other boats. After that I had a tough first beat and when I rounded the weather mark there were only two boats behind me. Then I lost another boat on the run which put me in ninth place. At this point, the third-placed boat was winning the Gold and all I could expect was the Bronze Medal. I knew I had to pull something out to get back on top. Most of the fleet had gone right, in towards the seawall, but I got into this line of breeze and headed out to the left, along with the two sailors ahead of me who ultimately won the Silver and the Bronze. I kept going further out until we sailed into this massive left shift. I was overstood and actually had to reach into the mark. As I got closer to the mark I could see with certainty with every yard I was gaining and picking off my competition. The shift had turned the run into a reach and after I rounded in third place I knew I had the Gold in my grasp, counting the overall points I had going into this race. Someone asked me later how I felt going down the last leg and I can tell you the finish line couldn’t arrive soon enough. As I got the gun I was so happy and so proud to win for my country. It was overwhelming. 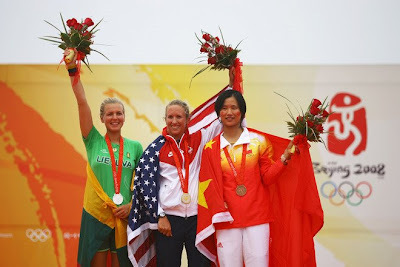 For a great slide show of my Olympics, mostly the Medal Race, go to http://sports.yahoo.com/olympics/beijing/USA/Anna+Tunnicliffe/222031 and then click on Photo Gallery. There are 54 shots in the archive, although some are duplicated. You should also be able to find this race archived on web-TV at http://www.annatunnicliffe.com/mambots/editors/jce/jscripts/tiny_mce/www.nbcolympics.com. For leg-by-leg race updates and overall results, go to http://www.sailing.org/olympics/resultscentre.php and click on Laser Radial Women in the left-hand column. Until the games are over you’ll notice some changes in the content of my reports and where they are located on my website. To comply with International Olympic Committee regulations designed to protect its sponsors’ interests, my reports are appearing on my special Qingdao Olympic Blog. The URL for the page is http://www.annatunnicliffe.com/content/blogcategory/29/113/. There is also a link from the home page of my website. The blog page includes hotlinks to official results and competition photos.